After spending two weeks thoroughly testing my DJI Phantom 4 in many different environments and situations, I feel that I can finally write an objective review of this drone, in which I cover some notable features, functions, and many things I learned about it. We also had an opportunity to compare the same images from the Phantom 4 to Phantom 3 Professional. Be sure to check out our video reviews with helpful camera tips, and some great examples of uses of new Active Track and Tap Fly intelligent flight modes. 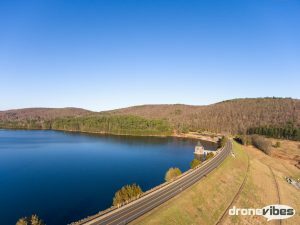 You can download our test photos and videos from a link provided in this article if you’d like to compare these for yourself and check out the image quality before spending your money on this new drone. I will also attempt to answer a question I was asked by many Phantom 3 users – is it worth it to upgrade to Phantom 4? Click Here to Download our Test Photos and Videos. The files are marked P4 for Phantom 4, P3P for Phantom 3 Professional, Camera Settings used for each photo and video are listed in the file names. Out of the box, this copter feels solid, and surprisingly heavy. The Phantom 4 features magnesium chassis in hard plastic shell, wit excellent fit and finish. For the $1400 purchase price, you get the Phantom 4 unit, the controller, one battery, a 100W charger, two full sets of propellers, 16GB micro-SD memory card, and a micro-USB cable for firmware updates. All this is packaged in a nice styrofoam case that can be used to transport the copter. It is definitely not your hard shell backpack, but it is a great starter case and will keep the drone safe during transport. I would also recommend purchasing an additional battery ($169), a set of ND filters ( ND4, 8, and 16, I recommend Polar Pro), and a controller harness. DJI offers 6-12 months warranty on most of the P4 components with the exception of the frame and propellers. You also have an option to purchase a DJI care service plans at $299 for 1 year, or $229 for 6 months, which provide you with repair or replacement credits should your aircraft get damaged in a crash. The Phantom 4 is the same size as it’s predecessor (only slightly heavier), with a few changes to the frame design. The propulsion system is very similar to the previous model. The motors now sit on top of the arms, and have vents at the base of the motor. Both of these changes help manage the motor temperature a bit better, which may come handy, especially during spirited flights in the new Sport mode. The propellers are also the same size as the P3 (0945), and they attach to the motors using a push&twist mechanism, similar to the one found on the DJI Inspire. This solution is much easier than the old twist-on design, and makes attaching and removing the propellers a quick and easy task – very handy if you’re using a backpack or a case as majority of them only accommodate the Phantom without the props. The drone now features additional two small forward facing cameras that are a part of the revolutionary obstacle sensing system, and two down facing cameras and sonar sensors which are a part of visual positioning system (VPS). The obstacle sensing system helps the Phantom sense and avoid obstacles in it’s path, while the VPS helps assist with positioning and navigation by using ground reference. To make the Phantom even safer, it now also features dual IMUs and dual compass, mitigating the risk of a sensor malfunction negatively affecting the flight performance or even causing a fly-away. The Phantom 4 stays more locked-in than it’s predecessors, with virtually no drifting with GPS and VPS enabled. The firmware upgrades can now be conveniently done by connecting the Phantom directly to your phone or tablet with the included micro-USB male-to-USB female cable. 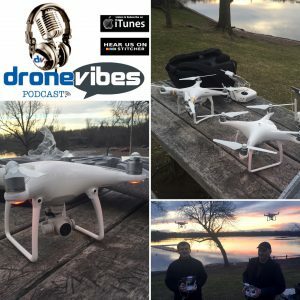 Listen to Petr and Erick discussing the new Phantom features in the latest episode of our Drone Vibes Podcast. The controller has been upgraded to look and feel like a DJI Inspire controller. It feels a bit more substantial in one’s hands. The relatively flimsy plastic phone/tablet mount on the P3 controller has been replaced with an Inspire-style aluminum one, a welcome upgrade. The Playback button on the right hand side has been replaced with a “Pause” button, which allows the user to pause the drone when executing intelligent flight mode missions. I quickly learned a value of this button – it serves as a great “emergency brake” if something goes wrong during the autonomous flight modes. It is a good idea for the user to always keep one finger on it when using intelligent flight modes. The flight mode switch still has three positions, but their meaning is a bit different. The P-mode is the traditional GPS mode – in this mode, the Phantom 4 is more docile, and yo can take advantage of all available sensors to help you maintain position, stable flight, and sense obstacles. All of the intelligent flight mode features are also available in the P-mode, and can be activated from the menu on the tablet screen. The S-mode, aka. Sport mode, allows the Phantom to reach speeds up to 45Mph, which is really impressive to watch. This mode still offers GPS and VPS assistance, but does not offer obstacle sensing or intelligent flight modes. The third position , A-mode, aka. Attitude mode also lets you reach speeds up to 45Mph, but turns off the GPS and VPS and only helps you maintain altitude. The batteries are 4-cell Lithium polymer based, with close to 1000mAh more in capacity over the P3 battery. They feature better locking mechanism that makes it easier to insert and remove the battery from the drone. The plug has also been redesigned, it is now a 10-pin connector on the bottom of the battery. The cells are spaced out to allow for vent holes through the battery, you can actually see through the battery – an interesting battery heat management solution. DJI claims 28 minute flight times, I was able to get to 26 minutes, landing at 9% remaining capacity. Most questions from my peers and colleagues were about the camera and how does it compare to the Phantom 3. The Phantom 4 camera sports a 1/2.3” sensor, which is the same size as the sensor found in Phantom 3 Professional or a GoPro. It offers 12MP resolution (4000×3000 pixels) and up to 4K-UHD video recording. The 20mm (35mm format equivalent) lens offers 94 degree field of view and f/2.8 fixed aperture, 100-3200 ISO range for video and 100-1600 range for photos. The available shutter speeds range from 8s-1/8000s. The camera gimbal has been redesigned-the vibration dampening blocks are now inside of the shell, which only has an opening for the yaw axis motor and gimbal arm. The camera is supported from both sides along its tilt axis, making it more stable and helping eliminate gimbal drifts. The camera lens design and material have changed, offering slight reduction in lens distortion and aberration. The tip of the lens body is threaded to accommodate ND (or other) filters. I tested the unit with Polar Pro filters I had for my Phantom 3, and they fit perfectly. I strongly recommend using the ND filters for 180 degree shutter and smooth videos. The shutter speed under regular light conditions is too high without an ND filter, which gives the video a jittery feel. The camera offers 2X digital zoom – you can simple pinch-in on the screen to zoom-in. The zoom does not work in 4K or at 120fps (slow-mo) setting, but will give you a nice 2X zoom for video from 2.7K down and for still pictures. 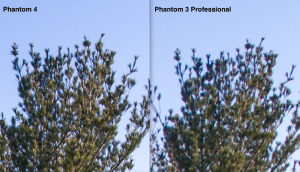 This may be helpful to capture more distant objects with the Phantom’s wide lens. One can argue that you can record in 4K and then simply crop down in post, but recording in 2.7K at 2x zoom uses less compression, so the resulting footage quality should be better. The 2X digital zoom also works for still pictures. Interestingly only the JPEG versions get saved “zoomed-in” ( at 4000×3000 pixels), the DNG versions still get saved, but only as a full frame that does not reflect the digital zoom crop. Just like the Phantom 3 and the Inspire, the video is a bit too sharp, which causes some artifacting in parts of the image (jittery or soupy feel to uniform areas of the video). To get around that I recommend using custom settings to turn down the sharpness to -1 or -2. It is easier to sharpen the video in post. I usually shoot in d-log color profile, and dial down the sharpness, contrast, and saturation to -2. The P4 offers the ability to record 1080p at 120fps and 47 degree fov, which is a really nice feature for slow-motion effects. With this setting, the clips will play back in slow motion by default. The camera also features a function called 3D noise reduction, which has previously only been available to the X5 camera users. This function is on by default and is supposed to help reduce the image noise. The image noise is marginally better when compared to the P3P. 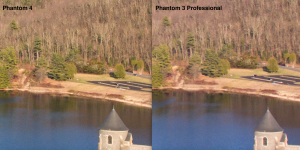 When compared to the DJI X3 camera on Phantom 3 or the Inspire, the P4 camera offers marginally crisper image, I have not noticed any significant difference in dynamic range (perhaps slightly more detail in shadows and less noise in low light). It also seems to set the white balance a bit differently from the P3. For side-by-side comparison, we took the same pictures using the same settings on Phantom 4 and Phantom 3 Professional. You can see these test photos in this article, or download the RAW test files from the provided link and compare yourself. This folder also includes a few video clips in 4K (Auto and d-log with lowered sharpness, and 120 fps slow-motion). I was really impressed by the image quality from this consumer drone. Perhaps the most revolutionary feature, and the first time that a consumer level drone is sold with “real” obstacle sensing technology. The obstacle sensing only works forward and below the copter, so it is still possible to fly it into things backwards or sideways. The user gets to decide whether to allow the drone to fly backwards in the active track mode. This function also only works in the P-mode, and is available in intelligent flight modes and return to home. Depending on the situation, the drone decides whether to hover, fly over the obstacle, or fly around it. When flying in normal mode, it always stops 5-6 feet away from the obstacle. In intelligent flight modes it will still stop and hover in most cases, but will adjust the flight path to go over or around the obstacle if it can find a safe way. I am not sure how the drone decides what to do, but during my tests it seemed like it will stop and hover if the obstacle takes up more than half of its field of view. I tried sending the Phantom into bushes, my car, into myself, and even through a tree line a few times, and it was always able to detect the obstacle and and stop or avoid it, however in most cases it got much closer to the obstacle than I was comfortable with. The user gets to see bars and numbers representing the distance from the obstacles, superimposed over the top of the live feed – similar to a back-up camera display in a car. We discovered that the obstacle avoidance gets really confused when flying towards the sun, constantly stopping to avoid these “phantom obstacles” (no pun intended). This function can be turned off in case it causes problems. The obstacle avoidance is disabled when prop guards are used. When turning the copter on, it should not be facing any nearby objects, otherwise it confuses these objects for prop guards and disables obstacle avoidance. I have also gotten sensor error messages when trying to take off on asphalt surface, so if the obstacle sensing system seems to have a problem, try moving the drone to a different surface first. The flight mode icon displays on the screen when the Phantom is in the P-mode. Pressing this icon opens up a menu that allows the user to choose from available intelligent flight modes. The Phantom 4 offers the “classic” Home Lock, Course Lock, Waypoints, and Follow-me modes, plus two new great features – the Active Track and Tap Fly. I’ve spent a lot of time testing these two features in different environments, and while some refinement may still be needed, I think they are very powerful tools to help the user get shots that would be really difficult or impossible to get with any other single operator small drone. Active track allows the user to track objects by selecting them on the screen. You can simply point the camera on the subject you’d like to be tracked, and select it by either pressing on, or dragging your finger diagonally across the subject on the screen. The latter method lets you define the area/object to be tracked more precisely. Once the drone locks on the subject, a green “GO” rectangle displays over the image. Pressing this GO button starts the tracking. The drone will follow the subject maintaining its distance. The tracking always begins with the subject in the middle of the shot, but you can reposition the subject on the screen by holding your finger on the active track crosshair, and dragging it to a new position on the screen. You can still control the Phantom in this mode, the controls work very similar to the point of interest mode – pitching forward moves you closer to the subject, pulling back moves the drone away from it. Rolling right or left will make the drone circle the subject in a corresponding direction. You can also change the altitude with throttle. The rudder/yaw and camera till are controlled by the Phantom. DJI claims that the Phantom needs to be at least 9ft. off the ground for the active track to work, it worked at 6.5ft during my tests. 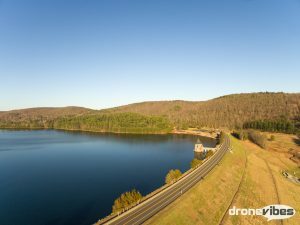 The drone will limit the maximum distance from the subject and altitude in order not to lose the subject. There are a few factors that determine this maximum distance and altitude, and whether the object can be successfully tracked altogether – the size of the subject, the contrast between the subject and its surrounding environment, the light conditions, and presence of any similar objects in the frame. Following are few examples of situations I’ve encountered:The Phantom is able to track a car from larger distance than a person. It will have difficulties tracking a person in grey clothes walking across an asphalt parking lot. 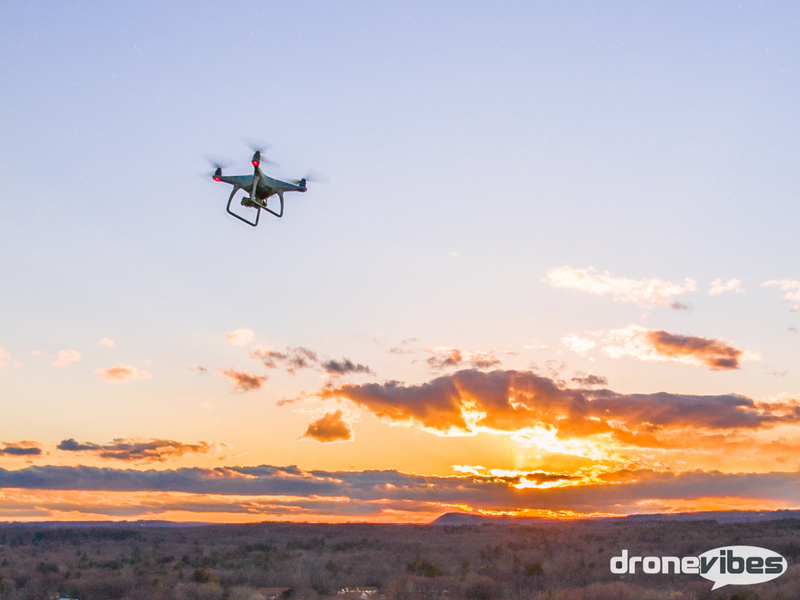 If your subject gets in front of or behind some other object of similar size and color, the drone gets confused and often begins to track this similar object. In few cases the drone locked onto another object further or closer to it, and began to abruptly fly towards or away from the tracked object in an attempt to keep at a constant distance. In one case, it almost hit another Phantom, in another it almost flew itself backwards into a tree. My recommendation is to always keep your finger on the flight mode pause button. The object avoidance works with the active track, but will not protect the drone from flying into things backwards or sideways. The user gets to choose whether to allow the Phantom to fly backwards when tracking, which really depends on the situation and users comfort level. With the backwards tracking enabled, the Phantom will fly backwards if the subject is moving directly at the Phantom. Once the subject moves about 15 degrees to the left or right, the Phantom will slow down, move to the side, rotate around and get behind the subject. It is possible for the drone to lose the subject it if moves too fast or abruptly changes direction. You can also “track” stationary objects, in a fashion similar to point of interest mode. Once the tap fly mode is selected, the user can simply tap on the screen to select a direction for the Phantom to fly in. Once selected, the “crosshair” turns into a green “GO” button. Pressing the button sends the Phantom in the desired direction. The speed can be set by using a slider on the live preview screen. If the camera can see the horizon, a horizon line will appear on the screen. The Phantom will ascend if the set direction is above this line, or descent if it’s below it. You can change the direction mid-flight by simply tapping on the screen. When descending, it will level off at around 12 feet and not fly below this altitude in tap fly mode. It will also not let you choose direction that would send the Phantom into obstacles or into the ground. The stick input still works, the roll command response is very tame, pitching forward doesn’t affect the speed, but pulling back will interrupt the tap fly execution. You can change altitude using throttle, and using the rudder/yaw command will change the direction the drone is heading in. This mode can be used for nice “cable cam” style shots, however only flying forward. The Phantom 4 is a nice evolution of not only the DJI consumer drone line, but consumer level drone segment altogether. It is the first ready to fly drone sold with obstacle avoidance technology, and is packed with really interesting and helpful features. If you’re a newcomer into the drone world, I would recommend learning the controls on a simulator or a small inexpensive copter first to avoid a costly mistake and disappointment. Here is my recommendation to the Phantom 3 users. While the camera improvements may not be enough to justify the upgrade to the Phantom 4, the additional features definitely are. However, these features are really only helpful when shooting video, so if you’re using your drone mostly for still photography, you will be just fine keeping your Phantom 3 until some major camera changes are introduced to the Phantom line. Lol, I actually upgraded to P4 without feeling like one. While the camera is pretty much the same, I really love the endurance (makes a huge difference to me), the speed (sports mode), and love the active track feature, which makes it easy to get great tracking shots in a much safe manner. It is a great evolution of the Phantom platform. Excellent review and very informative Peter. For me an upgrade from the Phantom 1 to the 4 seems a bit of a no brainer ??. Keep up the great work and thank you from the Drone Addiction Team.